Bordeaux is undergoing a steady gastronomic revival with a new generation of chefs rethinking the whole concept of the metropolitan dining. In other words, Bordeaux’s kitchen is on fire. There is so much of hip, classic and fusion on the city menu, that whether you prefer home-style cooking or haute cuisine tastes – hungry rumbling of the stomach is out of the question. To make a point even stronger, two renowned kitchen masters and TV stars recently moved to Bordeaux and settled in the restaurants right in front of each other – the Scottish chef Gordon Ramsay and the French one – Philippe Etchebest, both with Michelin stars in their apron’s pockets. In front of each other, no kidding. PS. I did try Ramsay’s signature dish – Blonde d’Aquitaine beef Wellington and served with a view of the Bordeaux Grand Theatre it made a spectacular experience. The sin of gluttony in Bordeaux is, alas, inevitable. The sin of gluttony in Bordeaux is, alas, inevitable. Traditional southwestern cuisine is known to be heavy and heavenly at the same time and does not leave much room for neither moderation, nor (pardon…) vegetarianism. However, the city is working on the latter issue with a bit of help from black Perigord truffles, flavourful goat cheese, finest aged Comté (and other zillion types of amazing cheeses), filling haricot beans, and the most sugary Agent prunes. Still the crème de la crème of the local cuisine is somehow duck and goose-based. Probably, one hand is enough to count on fingers the restaurants in Bordeaux where you will not get famous foie gras, crispy-skin goose confit or magret de canard with a prune sauce or pears poached in red wine – the dishes from the basic local farms ingredients but with potential for the Michelin guide. Another unquestionable miracle of the regional cuisine – is oysters, the majority of which grew in the waters of the Arcachon bay. The reverential attitude of locals towards those mollusks is somewhat similar to their attitude towards wine: the Bordelais pay a great deal of attention to the shape of the shell, analyze the aroma compound and unmistakably guess by the texture and taste whether the oyster spent its happy adolescence in the waters of Cap Ferret or Hossegor. Bordeaux is definitely a place to have your first oyster epiphany. In fact, if all your life you sincerely considered oysters to be just a tasteless alien-like substance – Bordeaux is not the place to share this confession. However, it is definitely a place to have your first oyster epiphany: just head to the market and get a degustation plate for 6-10€, wine included. Bordeaux feeds its citizens from 12 to 15 and from 20 to 23 but anytime between that it generously pours the wine, which is accompanied by the selection of Basque cheeses and charcuterie – assorted ham, sausages, terrines and melting in the mouth pâtés. As for the sweet stuff – treat yourself with the typical dessert à la bordelaise, cannelés. Those are tiny and a bit chewy cakes with caramelized rum and a dash of Bourbon vanilla. Here I have to give you heads up: it tastes as intriguing and controversial as sounds. Bordeaux is an exceptionally elegant city, where fairytale-ish, gothic, neoclassic and hip are mixed in the most fortunate proportions. Here you find the Baroque and Romanesque churches, the Flamboyant Gothic basilica, the cathedral and the Big Bell tower – each with own set of so hideous and so beautiful gargoyles, a couple of pompous allegoric fountains, some neo-Classic palaces, façades with an Art Deco touch, and even the ruins of Gallo-Roman amphitheater. Not to mention a lavish handful of charming squares, ideal for the morning coffee and evening Merlot. To capture it all – climb all 231 steps of 15th century Pey Berland tower, it offers a beautiful panorama and a slight vertigo effect. To those, who have a thing for the superlative degree, Bordeaux offers the longest shopping street in Europe – rue Saint-Catherine, the highest vertical-lift bridge, and the largest European city square – Place des Quinconces. Twice a year it hosts a remarkable antique market, where you can find practically everything: from the Napoleon III style furniture to the 19th century edition of Jules Verne’s “Twenty thousand leagues under the sea”. Another architectural must-see is definitely the Water Mirror fountain (Miroir d’eau) – an elegant, like Château Margaux wine, decision of the city to turn 130 m² square into the biggest reflecting pool. Surely, it can be nominated, if not for Pritzker architectural prize, then for some kind of a local Oscar in the “city development solution”: at one go Bordeaux got the most spectacular postcard view ever, plus – made dozens of hundreds kids, locals and lovers euphoric. Voilà! Centuries-long history predictably left in Bordeaux an impressive amount of “temples of culture” of all shapes and kinds. Among such are the Museum of Fine Arts that gently leads its visitors all the way from the 15th century Renaissance to Delacroix and the bordelaise symbolist Odilon Redon; the Museum of Contemporary Art located in the former warehouse for colonial goods, or Cultural and Art center in the quarters of the former submarine base. And, oh, Utopia movie theatre in a former church building, place equally loved by all citizens. Former warehouse, submarine base, church – Bordeaux cultural landmarks have… different locations. For the classic night out there is an imposing Grand Théâtre, built on the sight of Roman temple and old enough to witness the first ballets of not yet famous Marius Petipa. If you are not lucky with the tickets – get a guided tour from the Tourist office nearby: the building itself is an absolute marvel and worth a visit. In Bordeaux wine and culture are in the same synonymic row. Bordeaux is the city with a rich past and a thriving present. 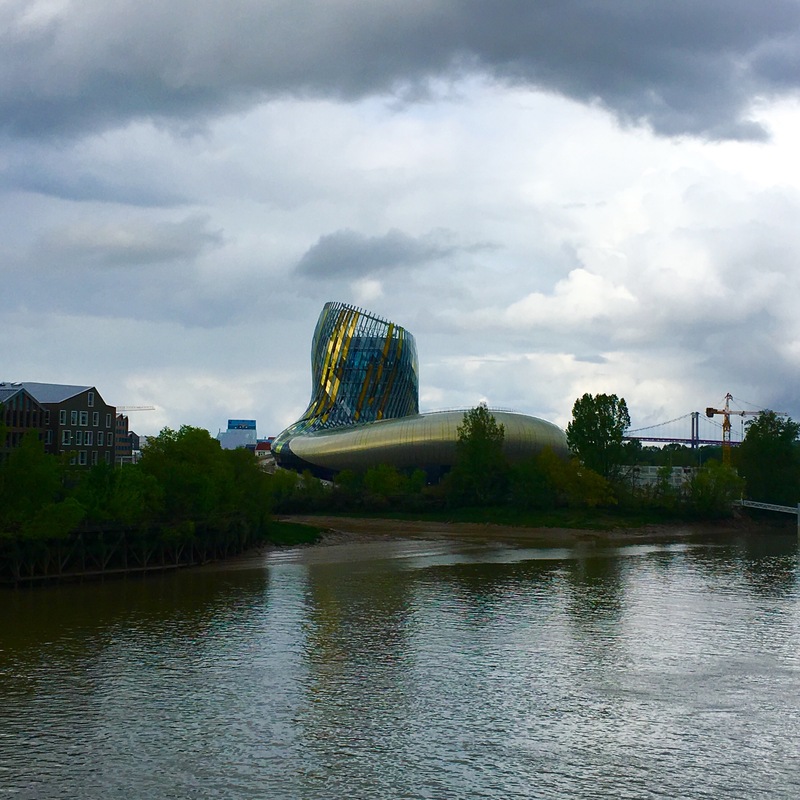 Now, lots of excitement is stirred up by the opening of the new wine centre – La Cité du Vin, an ambitious cultural and educational project embedded in the extravagant architectural shape. According to Alain Juppé, La Cité is meant as a “wine travel center” but we, the visitors, see it more as some kind of wine Guggenheim. Its à la carte includes everything and more, from virtual reality binoculars and Pepper’s ghosts to exclusive art exhibitions and theatrical performances. As in Bordeaux wine and culture are in the same synonymic row. And if after two thousands of words I still did not convince you, then maybe the most à la bordelaise events will – la Fête du Vin (Wine festival in June, even years) and la Fête du Fleuve (River festival in June, odd years). Wait till a grand finale with the fireworks in the summer sky and see if Bordeaux becomes your new favorite fairy tale.